The best way to start a successful homecare business! 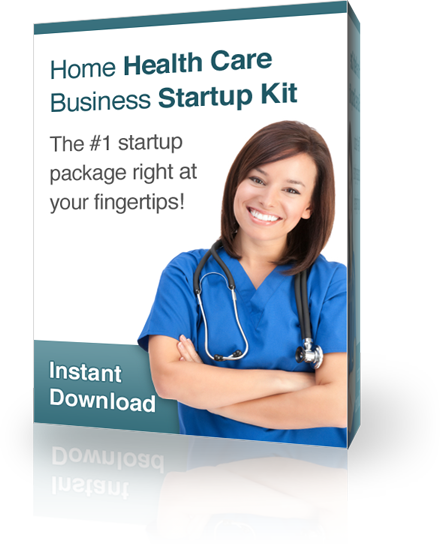 Our Home Health Care Business Start up Package includes over 100 professionally formatted, comprehensive documents and templates in word and excel that are all fully customizable. Market your homecare business & build a referral network. Our homecare business guide will show you how to market your services effectively while building a referral network to grow your business quickly. The best way to improve a start up or growing home care business! Manage your home care business costs and risks, save time and effort, increase employee effectiveness and productivity, and improve overall homecare customer satisfaction. How to start or improve a home health care business! Start up Guide, Business Plan Tools, Over 100 Professionally formatted Home Care Business Samples and Templates, Completely Customizable, Affordable, Instant Download or CD. Instant download or CD! Package includes over 100 customizable documents. Our business plan guides and home care business plan samples will assist you to write a comprehensive business plan on how you will start, improve, operate, and grow your home care business. Gain a professional home care service provider image with your clients and employees by using our comprehensive tools, training materials, employee handbook, forms and templates. There are effective ways to advertise, market and build a referral network for your home care business. Our Guide, templates, and samples will assist you in quickly growing your home care business. Our home health care business start up guide, home care business plan samples, business plan guides for new and established businesses, home care revenue/expense calculators, and our home care business forms, templates and caregiver training manual will help and guide you along your journey by saving you time in starting and operating a successful medical or non-medical home care business. This is one resource you won’t want to be without when starting a home health care business. The medical and non-medical home care business industry is on the rise, as the first wave of Baby Boomers leading the “Silver Tsunami” hit in 2011. With life expectancies longer than even a generation ago, the number of people in the US aged 65 or older is expected to be 71 million by 2030 – more than twice what is was in 2000. Now is the perfect time to capitalize on this trend and start a medical or non-medical home care business. As the Baby Boomer generation ages, the need for home care services increase. If you are interested in starting a home health care business to provide service to the baby boomers, you will definitely have a large and growing market. Starting a home health care business seems to be one of the biggest trends in helping fill the current home health care shortage. One of the most challenging parts of starting a home health care business is knowing how to start a home care business quickly and cost effectively, creating a home health care business plan and developing all the required home health care documents, forms, templates, and manuals that allow you to operate your business professionally and efficiently. If you're ready to start your home health care business, you want to start with a business plan. The easiest way to do this correctly is to follow a professional business plan guide while utilizing a comprehensive home health care business plan sample that has already been used in the industry. If you want to get your medical or non-medical home care business started quickly and easily while eliminating as many mistakes as possible you will benefit from our Home Care Business Start up Package. It includes over 100 comprehensive, professionally formatted home health care forms, documents and templates in WORD and EXCEL formats. Our home health care business plan sample and all our forms, documents and templates are FULLY CUSTOMIZABLE so you can add your business logo, customize footers, and make changes to meet your start up and growing home health care business needs.